Some time back I had written a poem about the Turtle and the Moonfish. This is Part 2 of what happened since then.Click here to read the first poem. And had let the past be. A bruised turtle hoped to find. And spent many happy hours together. And said would be there forever, for each other. And she felt so grateful. Her heart was overflowing and full. As she had been hurt before. Yet, she longed for more. And in her love she would trust. So she told him and she waited. Her heart little by little deflated. She could bear it no longer. She could also hear him groan. practicality sparks..........but the show goes on nd on. Ohhh No!! I thot the turtle will find her true love this time... Does this mean a woman should never propose and let the man pursue always??? a touching poem...it gives a feeling of 'Picture abhi baaki hai mere dosth'..
Nice, but was really hoping the turtle would get her true love this time, how much we crave for happy endings! oh damn! and I thought the turtle will get a happy ending this time ! VPP: Let's wait and watch! Pointblank: I don't know. I guess it is specific to each situation. Fantasy: yes--the show must go on. Welcome to my blog. I guess this is the first time I am seeing you around. oh no!! I thought the turtle found her love too!! Better luck next time uh!!? I hope she does not become depressed in life now!! 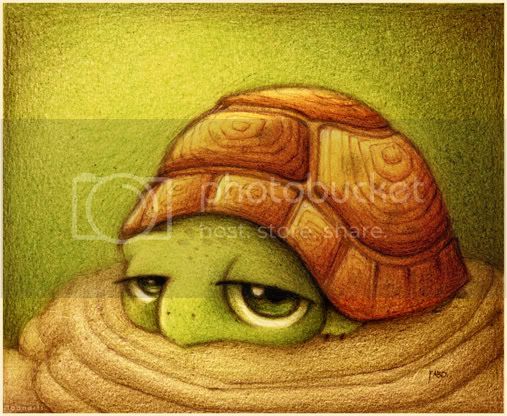 but feeling sad for the turtle..